Irvine, California - Pasternack, a leading provider of RF, microwave and millimeter wave products, has released six new free-running reference oscillators that generate a highly stable and accurate output frequency response with low phase noise and spurious performance levels, making them ideal in phase locked loops, function generators, frequency synthesizers and receivers for communication, radar, navigation, surveillance and test and measurement applications. These free-running, fixed-tuned oscillators use a high-stability internal crystal reference as an integral part of the phase-locked assembly with a buffered amplifier output stage for improved ruggedness. They provide a highly reliable single output frequency source and excellent performance with respect to temperature stability, induced noise and overall efficiency. Pasternack's six new free-running reference oscillators are available with single output frequencies of 10 MHz, 50 MHz or 100MHz.These designs offer a dependable frequency output with stability levels of +/- 5 ppm and are aging-rated at less than 1 ppm. Additional typical performance features include an output power level of +7 dBm, phase noise as low as -150 dBc/Hz at 10 KHz offset and low spurious output of -70 dBc. These modules operate over the full temperature range of -30°C to +70°C and require a single positive DC voltage supply. They are available in either a compact SMA connectorized package with DC bias pins, or a true surface mount package outline that has a downloadable Gerber file for the mounting footprint. These rugged SMT and coaxial package designs are highly reliable and meet stringent MIL-STD-202 environmental test conditions for shock and vibration. "Pasternack's new series of free-running reference oscillators are fixed-tuned for convenience and offer single output frequencies that are highly accurate and stable over time. These modules are particularly useful for designers with applications that involve phase locked loops, or as an external reference source for frequency synthesizers," said Tim Galla, Active Component Product Manager at Pasternack. Pasternack's free-running reference oscillators are in-stock and ready for immediate shipment with no minimum order quantity. 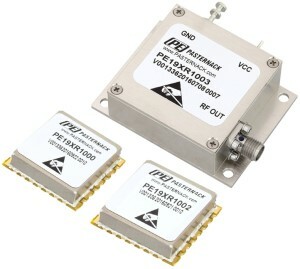 For detailed information on these products, please visit https://www.pasternack.com/pages/RF-Microwave-and-Millimeter-Wave-Products/free-running-reference-oscillators.html..